Some 3rd party solutions try to convince B2BGateway's clients that switching EDI providers is necessary in order to complete testing with that trading partner. Don’t get tricked into thinking that switching EDI providers is required to setup with a trading partner that uses a 3rd party EDI solution. 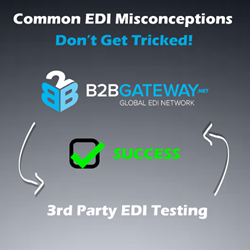 B2BGateway would like to take a minute to clear up any misconceptions that tend to get thrown around in the EDI world regarding 3rd party testing. Before setting up with ANY trading partner that uses a 3rd party EDI solution, don’t get tricked into believing that the need to use that 3rd party EDI solution to successfully test and work with your trading partner is a requirement. Some 3rd party solutions try to convince clients that this switch is necessary in order to complete testing with that trading partner. Simply put...this is 100% not true. A company has the option to work with any EDI solution they choose to work with, regardless of any sales pitch that says otherwise. We successfully integrate clients with any trading partner and we have worked with all the 3rd party solutions out there so there is no need to switch. If there are ever any doubts, before making any decision, please feel free to reach out to a B2BGateway Project Manager or Sales(at)B2BGateway(dot)net. B2BGateway values their clients business and are always their to help make a decision that is right for your business and is made under your terms.